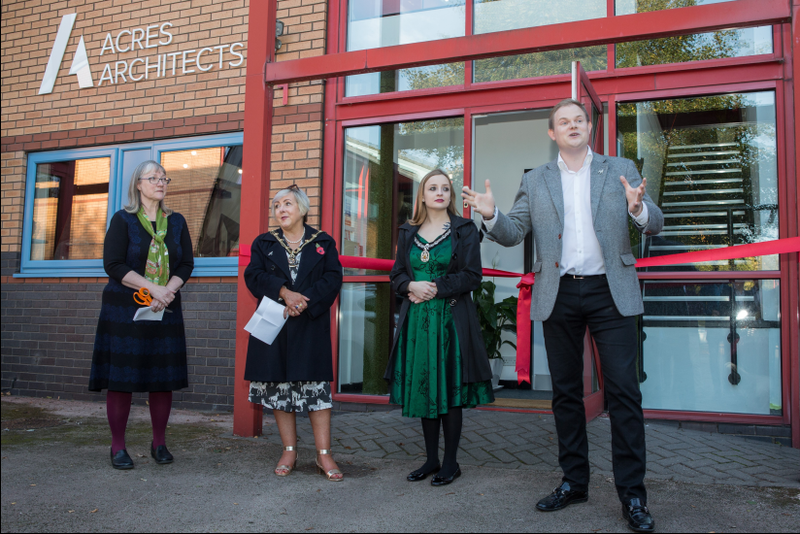 Jodee Best - Acres Architects, The Sheriff of Nottingham Councillor Catherine Arnold, The Sheriff’s Lady Ms. Alice Adams, Edward Acres - MD of Acres Architects. Nottingham-based Acres Architects has recently relocated to a larger office, unveiled a new brand, and launched a new website all in the space of a week. The relocation and rebrand comes as a result of the company’s growth over the past few years, which has seen a 200% increase in sales since 2016. It has received recent new business enquiries & appointments of projects with up to £38 million in construction value, and is anticipating to double business turnover in the next 12 months. Acres Architects’ new office is based in Nottingham Science Park, which is already home to some of the most innovative companies in the East Midlands. It also boasts award winning architecture which is designed to inspire creativity and increase both productivity and quality of life for businesses and occupiers. The new office is capable of housing more than 16 staff, and there are plans to recruit and grow the award winning team to 10 staff before the end of the financial year. The launch of the office space was attended by a number of clients, contractors and local business, and was officially opened by The Sheriff of Nottingham Councillor Catherine Arnold, and The Sheriff’s Lady Ms. Alice Adams. Alongside the new office, Acres Architects has invested in a rebrand, and brand new website to keep up and reflect their growth and ambitious plans for the future. The new space will allow the team to work even more collaboratively, to deliver innovative solutions to meet the needs of their clients. Split over two floors of the new building, the office features a production studio with the latest BIM and design softwares, break out meeting spaces, and a creative studio. The creative studio is for the design team to work in virtual reality, and utilise 3D printers and other industry leading technologies to design out risk at early stages of projects.